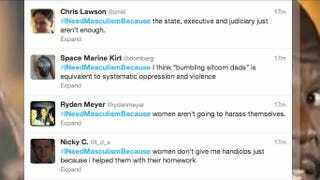 After some Reddit/4chan MRA babies tried to make #INeedMasculismBecause happen on Twitter today (co-opting the popular feminist meme, because EYEROLL), it blew up in their faces bigtime. The hashtag was gleefully hijacked by the normal, thinking humans of Twitter, who are currently churning out hundreds of tweets lampooning Men's Rights talking points. I had to scroll down for years to find one sincere #INeedMasculismBecause tweet from an MRA. (And when you do find them, they read like parody anyway.) It's pretty awesome.